The Hump: That moment of indecision late, late in the IndyCar off-season when withdrawals have you weighing ice-picking your eardrum and tying your uvula to a top-fuel dragster. LEAVE YOUR UVULA ALONE. Relief is in sight. The good people at Indy Cars and Coffee, the Graham Rahal Foundation, and the Dallara IndyCar Factory have come together to save you from despair. A one-off special has the ICC folks rolling their glorious rides up to the Dallara Factory on Main Street in Speedway on March 9th. The occasion? IndyCar driver meet-and-greets, factory tours, iRacing challenges, and more! But wait. We're just getting to the good part. 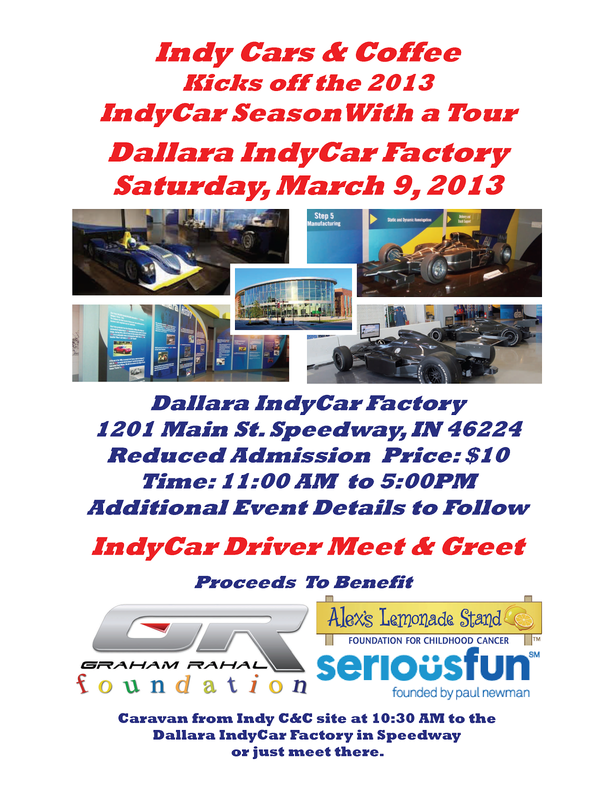 All proceeds of this special, one-time event go to the official charity of andhesonit.com, the Graham Rahal Foundation, benefiting Alex's Lemonade Stand and Serious Fun. Kids. It's for the kids. So... cram the fam into the Family Truckster, roll up on the Dallara Factory around 11:00 AM, and have a blast. Graham will be there, Tag and Pippa, too. Cost is a measly ten-spot, and once you drop a little something extra into the kitty for kiddies, even Old Man Winter can't put the chill on the warm and fuzzies you'll feel. iRacing challenge is $5/5 minutes, and the fastest time of the day wins a SPECTACULAR Grand Prize—a 185 MPH grand prize, to be exact. Oh, what could it be?! Generally have fun, communing with your fellow fans, getting warmed up for the start of the IndyCar season. Seriously. Why not? Get past this last bit of excruciating inactivity, have some fun, and do a little good. It's a win-win-win! A grand time shall be had by all.